While on a routine mission in Fallujah intelligence officer Ryan Evans is captured by insurgents and forced to witness the torture of children. The only way to stop the madman from killing even more children is for Ryan to sacrifice his own wife and daughter by giving up their address back in the states. After years of dedicating more time to the military than his family Ryan faces the reality that he doesn’t love his wife anymore but he could never make that choice. When his captor is distracted Ryan escapes and gets rescued by the military but the torture has taken its toll. He has a mental breakdown and runs to the comfort of his family however it’s too little too late. His wife has moved on and his daughter Bethany has no desire to have Ryan in her life. Then without warning Bethany is kidnapped by the serial killer BoneMan who kills by breaking every bone in his victim’s body without breaking the skin. Leading the investigation the FBI begins to suspect Ryan is the BoneMan and Ryan’s actions take on a whole new light. 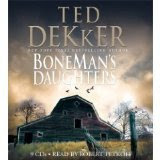 BoneMan’s Daughters is an eerie thriller. The BoneMan is seriously creepy. He reminds me of Buffalo Bill in The Silence of the Lambs…a madman with a strange fascination for lotion. I especially loved the way Dekker portrayed Bethany. She was beautiful with an emerging modeling career but she wasn’t a typical stuck up teen. She acknowledged that she was lucky to have her looks and wasn’t at all superficial. She was actually more down to earth than her mother who was very shallow. The part I like the least of this read was Ryan himself. I get that he wrestled with demons but he was also way to whiney for me. Overall it’s still an intense read and I recommend it for all thriller lovers. Thanks for the detailed review. I love books like this-I have it on must read list. This is the second great review I've read of this book. It's going on my list. Thanks! I thought this book was pretty good. I thought it was odd that Ryan became such a family man all of a sudden. The whiney main character would REALLY bug me but the premise does sound interesting.